An afternoon tea loaf made with Yogi Classic Tea – an Ayurvedic blend with cinnamon, cardamom and ginger. I am well familiar with the Yogi Tea brand. Having previously worked in the independent health food industry for a decade of my life, Yogi Tea was a regularly stocked and popular item. 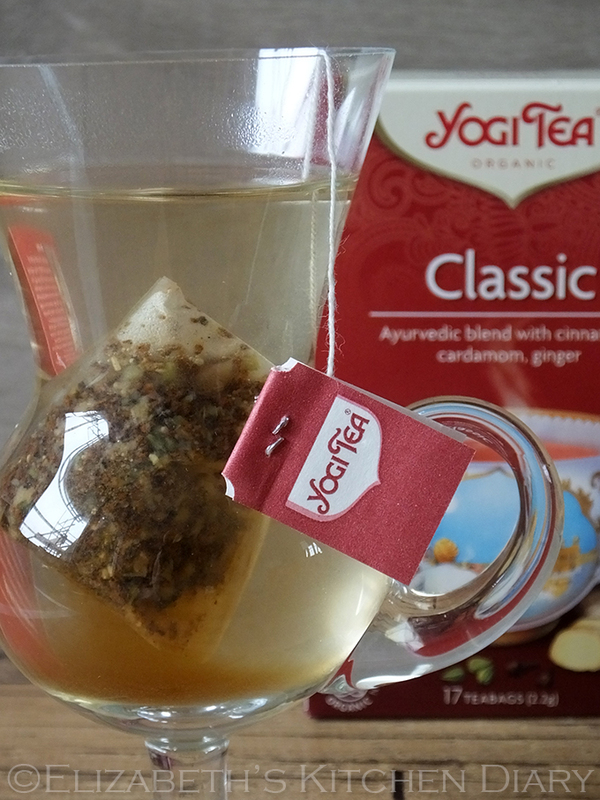 Yogi Tea have been supplying Europe with delicious, Ayurvedic tea blends since the 1970s. This Spring, the Yogi Tea range of over 40 herb and spice teas has a new look: they have revised and updated the design of their flavours, in bold, colourful packaging. They really do have something for every taste and every mood, whether it’s something to help you get to sleep at night, something to revitalize, something to ease a sore throat, or just something warming to enjoy in the afternoon. Yogi Tea don’t just make amazing teas, they provide support and funding for people in need across the globe through various projects including The Kumari Project, the Nevandra Association, Naturefund, Doctors Without Borders and the Neighbourhood Program. I have only recently discovered the benefits of yoga and I can’t emphasize enough how it helps strengthen the body and calm the mind. Yogi Tea have a guide on their website for many physical and breathing poses to complement your mood, calm your mind and help achieve balance in your body. For each pose they have a suggested tea blend to complement the exercise. Yogi Tea Classic is the tea that Yogi Bhajan, a Master of Kundalini Yoga and inspirational teacher of Ayurveda and holistic living, used to serve to his yoga students. It is a blend of traditional certified organic Ayurvedic spices: cinnamon, cardamom, ginger, cloves and black pepper. 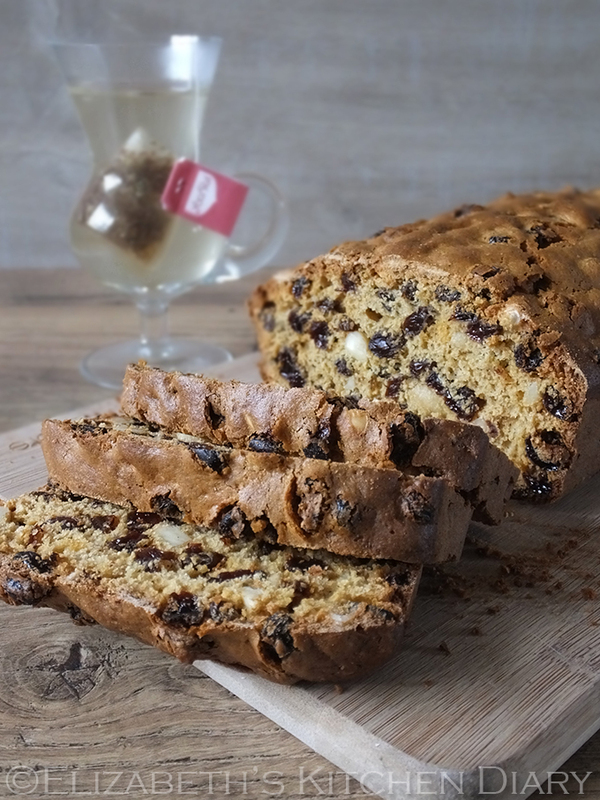 It is warming, relaxing, spicy and deliciously fragrant, and used to infuse seedless California raisins makes one fantastic afternoon tea loaf! 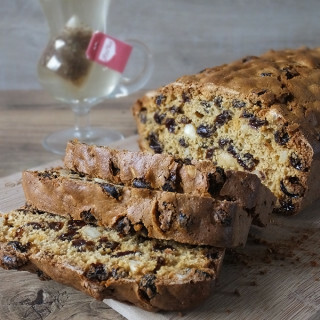 As the tea loaf recipe contains no butter or oil, the only moisture it has it in the soaked fruit – soak the fruit for as long as you can, preferably over night, but it still works well if you only soak for a few hours. I recommend thickly slicing the loaf and liberally spreading each slice with butter, and drinking a cup of warm Yogi Classic tea alongside. Each of the Yogi Tea teabags has a tag with a motivational quote on the back. Tweet your favourites using the hashtag #teatagThursday so Yogi Tea followers around the world can share! You can buy Yogi Tea at most independent health food stores, and you can find them online on their website, Twitter and Facebook. Seedless California raisins infused with Classic Yogi Tea - an Ayurvedic blend with cinnamon, cardamom and ginger - make for a delicious afternoon tea loaf. Dissolve the demerara sugar in the hot tea and pour over the seedless raisins in a medium sized bowl. Leave them to soak, covered, for as long as you can, preferably overnight, although two hours will do. The longer you leave them to soak the juicier they will be. If soaking for a short time leave the tea bag in with the raisins while they are soaking, to add more flavour. After the soaking process, preheat the oven to 170 C, and grease and line a 2 litre loaf pan. Whisk the egg lightly and stir into the raisins. Sift over the flour and stir until well combined. Fold in the blanched almonds and enough double cream to make a soft batter (1 - 2 tbsp). Spoon into the prepared baking tray and bake in the lower half of the oven (so that the top of the cake is in the centre of the oven) for 60-70 minutes. Leave to cool and then slice thickly and generously spread with butter. Serve with hot cups of Yogi Classic Tea for the full experience! To celebrate the launch of their new branding, Yogi Tea sent me a gorgeous hamper full of goodies, and enough extra goodies for me to share with one lucky UK reader! 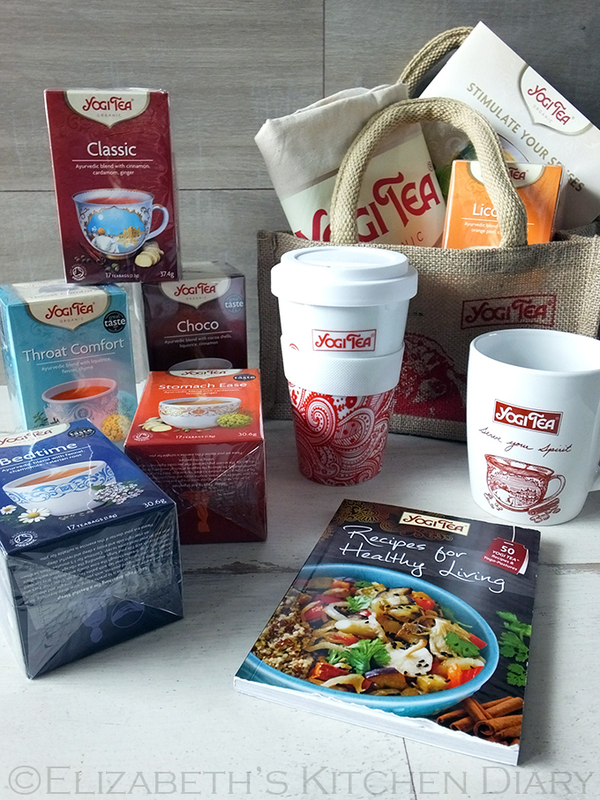 For your chance to win a Yogi Tea Hamper enter using the Rafflecopter form below. Come back and tweet about the giveaway every day for more chances to win! The prize is offered and provided by Yogi Tea Europe. The prize is to win a Yogi Tea Hamper. There is no cash alternative and the prize is not transferable. Closing date is midnight on Monday 15 June 2015 (GMT) and the winner will be announced that day. 1. Credit Crunch Munch by Fuss Free Flavours & Fab Food 4 All, guest hosted this month by The Baking Queen. This cake only cost me pennies to make, given most of the ingredients were given to me. As it contains no butter or oil it is a less expensive cake recipe to make. Now… I’m off to do my yoga exercises! Elizabeth’s Kitchen Diary received a Yogi Tea Hamper as compensation for this post, plus extra product for a giveaway. We also received some almond samples from Wonderful. All thoughts and opinions expressed are our own. This is not a paid post. I’d forgotten all about Yogi Tea, I used to drink it all the time and must go and find some so I can enjoy it again. I love how you used the Yogi Tea to make a tea loaf it’s one of my favourite bakes. I adore tea loaf. Reminds me of my childhood when my mum used to make it. green tea! yum 🙂 faye h.
Lady Grey is my favourite. Would love to try all those delicious sounding yogi teas! Chai has got to be my favourite, mmm! I do love the choco yogi too though. I go through phases depending on the weather. Right now I’m enjoying a Summer Berries one, I think it’s Twinings. liquorice & peppermint tean for me! Depends on the day. I love Yogi Tea Classic. Whenever I go to France I call into a branch of Monoprix and get some of their organic blackberry and ash green tea. There’s a place near me that does epic tea mocktails: the one based on lapsang and mandarin is particularly delicious. I’m a massive fan of jasmine tea! I honestly drink a lot of tea, but I am recently loving chrysanthemum tea and rooibos. I love herbal teas and drink them all day long! I drink different kinds at different times of the day but my overall favourite is probably fennel. My favorite tea depends on my mood and what I need at the time. If I need an energy boost I drink Green Tea with Jasmine, if I want something refreshing I drink Lemon Tea, after meals I drink Peppermint Tea to settle my stomach and for something different I drink Lotus Tea because I love the flavor. I do enjoy a cup of Fennel tea and it smells fantastic too! I absolutely love green tea! Ii love chai tea, mmmm! It really depends on my mood, I do love Chai! I love traditional, I also love iced tea, I lived in the states for a few years and I miss iced tea being in restaurants! I over herbal and green teas, I just love tea! I love a mix of Ceylon and Assam. I also love Russian Caravan Earl Grey. I love Lady Gray Tea a variation of Earl Gray. I love Chamomile tea. Nice and relaxing just before bed. Green tea with vanilla is my fave at the moment. I’ve not heard of Yogi tea before so will check them out. My favourite is mint. My summer crop of mint plants is coming along nicely so I can make fresh mint tea for the summer. Black with milk, mostly, but I enjoy chai and herbal teas too. Thanks for the competition. Ginger Tea is my absolute favourite – always makes me feel better. Love Lemon & Ginger Tea it wakes me up in the morning! I would love this as a gift for a very dear friend of mine. She’d love it as it’s so natural and she suffers allergies. I love blackcurrant and nettle tea! Earl Grey but I do love the sound of the cardmom fennel and ginger. Oh yes Yogi Tea is a good one. Hard to have a favourite as it all depends on mood, but I drink Rooibos the most often. Your tea loaf looks splendid. I love Jasmine tea !! I like various fruit teas. WOW! Well I’ve definitely learnt something new today 🙂 I’ve never really thought about Ayurvedic tea blends before. This loaf looks lovely though. Real comfort food! I have just tried yogi tea for the first time last week. I like the classic and choco best. I just love regular English breakfast from Twinnings if I’m honest, but that throat comfort sounds brilliant. Earl Grey or Asda Chai for daily use but Twinings Rose Garden (now discontinued) was my favourite treat tea. Yogi choco is great for an almost zero calorie hot chocolate (I add the merest splash of skimmed milk too). Looks like a lovely cake, we don’t see enough tea loaves these days. I love ginger and chai flavour teas. I’d love to try the stomach ease tea as I have stomach issues and a soothing ginger tea always helps. I’d also love to try making that tea loaf so that might have to be my weekend project! I must admit, I am a Yogi tea virgin, but you have sold it to me. I just want to run out to the shop and buy some now, and I’d definitely love to give the tea loaf recipe a go! The classic blend sounds very comforting, and the choco blend incredibly moreish! I love Twinnings Breakfast tea! This looks like a delicious tea loaf, and I love the story of the raisins jumping off the shelf! Thanks for linking up with #creditcrunchmunch. Lady Grey tea is my favourite I think but I like tea so much it’s hard to choose! I love Yogi tea! My favourite is the choco one – add some milk and it’s like a virtuous hot chocolate. Mmmm. I adore a good tea loaf and always used to drink Yogi tea, the almond flavour which was lovely. A great cake that keeps fresh for ages, great for beaching or long walks! My grandma always used to make a tea-infused loaf just like this – will have to give it a try myself!